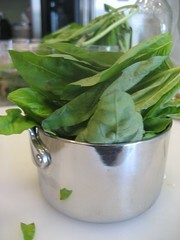 I pondered this question while I was making a pasta dinner and it hit me as I was chopping some basil….PESTO! (I love how random things just pop in my head long after I first contemplated them) But I have never made pesto, only enjoyed it. No time better than the present right? 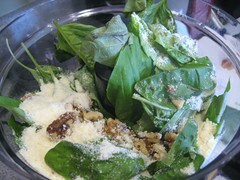 Pesto is normally made with pine nuts (my knowledge gleamed from watching too much food network), but walnuts are a nice variation. 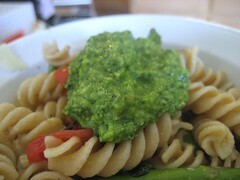 With the aid of my food processor (blender works too), a quality control spoon, and the basic pesto ingredients I whipped up some pesto that made me going back for more. 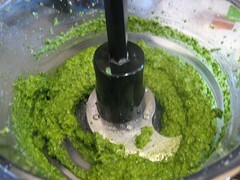 Place all the above ingredients in a food processor or blender and mix until a paste forms. 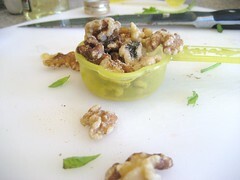 If it is too dry, add more olive oil drop by drop until desired consistency is created. 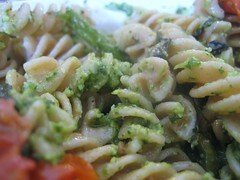 * It is great on pasta, scrambled eggs, and as a sandwich spread. Yum!